With around 60 days remaining until Round 1 of the new A-League season, the significance of the moment should not be lost. It will be the last edition of the league in its current form, with new teams involved when the 2019-20 season launches in just over twelve months from now. Long overdue, the excitement will be palpable, with potentially new derbies and rivalries on show, depending on the selection of the new franchise holders. For now, we continue to play a waiting game at which supporters of the Australian domestic competition have become quite adept over the years. That is not to say that the upcoming season will be merely a blip in A-League history; the forgotten year that filled the space just prior to the reinvention of the competition. There is still much to look forward to in 2018-19, with the championship race appearing wide open and incredibly difficult to predict at this early stage. Sadly, there is little to speak of in terms of marquee acquisitions. Keisuke Honda is the biggest of those and welcomed the announcement was. However, apart from a rather crazy experiment with a certain Jamaican sprinter on the Central Coast, it appears unlikely that further significant and potentially transformative names will be arriving at this late stage. Sydney FC appear the most likely to add considerable star quality to their squad in the coming weeks. There must be a few dollars in the coffers considering the talent and value they jettisoned during the off-season. Therefore, what will unfold is still tinged with uncertainty, as teams finalise their rosters and calculate the salary cap compliant numbers. A few young men will get their chance as promising rookies; brought up from the lower tiers and with the opportunity to prove to their managers that they belong. Rather than predicting what we will see, there are a few things I feel fairly confident we won’t when the season does get underway on October 19. Irrespective of your view as to the correct method of determining the champions of a domestic league, for the past two seasons Sydney FC have dominated the week to week component like no team before them. The finals loss to Melbourne Victory in April no doubt stung, but it was an embodiment of the unpredictability and opportunism present in play-off matches. Sydney’s record of forty wins, ten draws and four losses over two seasons of home and away play is imperious. Fortunately, for nine other clubs, it won’t be continuing in 2018/19. 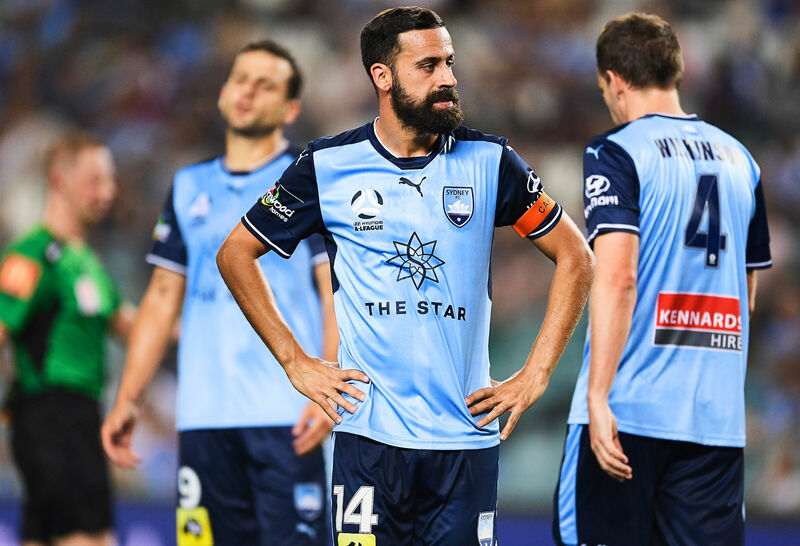 The losses of Bobo, Jordy Buijs and Adrian Mierzejewski cannot be understated and with Milos Ninkovic left to shoulder the load with the ageing Alex Brosque, Sydney’s chances look severely dented. Even with a late signing or two, new coach Steve Corica will struggle to have his squad performing anywhere near the level achieved in the Graham Arnold era. It looms as a significant leveller in the top six and might play out as a positive thing for the league overall. As potentially significant, exciting and internationally news worthy as Usain Bolt scoring for the Central Coast Mariners and proving his worth as a top tier footballer would be, it appears unlikely. Torn between the obvious commercial interest and investment that one of the world’s most recognisable athletes could bring to the Australian game and the more cynical thinking around the gimmicky nature of the experiment, I am not really sure what to think. As a footballer and watching from afar, he doesn’t appear to have a hope in Hades, yet brilliant athletes do spend much of their lives proving the world wrong. Good luck to Bolt if he can indeed make the squad, however, I don’t think we will be seeing his trademark ‘lightning bolt’ at Central Coast Stadium this season. Melbourne City will win the A-League Grand Final at AAMI Park next May. Huge call I know, especially considering its tendency to disappoint and capitulate when the moments are at their most significant. However, this is City’s year, with Bruno Fornaroli back to full fitness and a squad possessing a depth rarely seen in the A-League. Riley McGree and Rostyn Griffiths add much starch to the midfield and with the best defender in the league, Bart Schenkeveld, at the back, the puzzle pieces at Warren Joyce’s disposal look ominous. Dario Vidosic, Lachlan Wales and Scotsman Michael O’Halloran will ably support Fornaroli up front and as a unit look potentially venomous. I’m not sure who City will beat on the big day but the toilet seat will look very nice alongside the Premier’s Plate in their trophy cabinet. After the fairy tale run of the Jets, a botched VAR non-decision and with the heart of Newcastle well and truly won, it will be tough for the Jets to back up 2017/18. They have the talent yet will do the initial hard work without Irishman Roy O’Donovan who will serve his ten match suspension to start the season. Nobody enjoys seeing likeable players suspended yet people also take no pleasure in the sight of Lawrence Thomas’ face being imprinted with moulded studs. O’Donovan will sit out in excess of a third of the season, hoping his return is back into a winning team and one ready to challenge for the title for the second year running. It should be another compelling season of football, with a competition so close that it might be a little easier to predict what will not happen, as opposed to what will.